Hello and welcome to Flawed yet Functional! 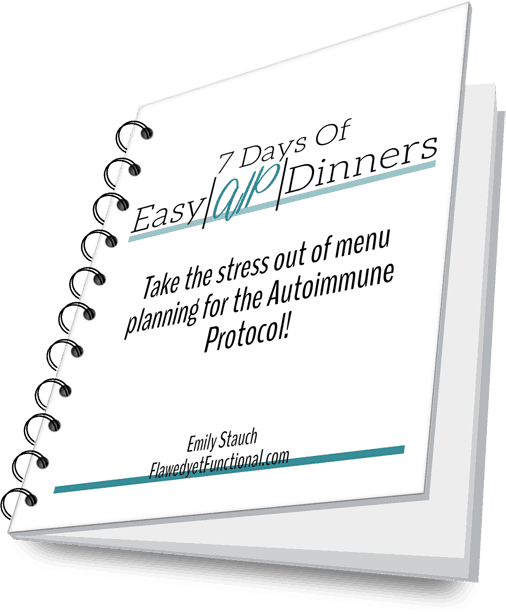 I am a Type 1 Diabetic who has found healing of my gut and thereby insulin-free management of my diabetes. Type 1 Diabetes is also called insulin-dependent diabetes (The pancreas is dead or dying.) but not for me! How have I managed to not be on insulin? I follow a gluten-free, high vegetable, and dairy-free diet, a.k.a. Paleo! 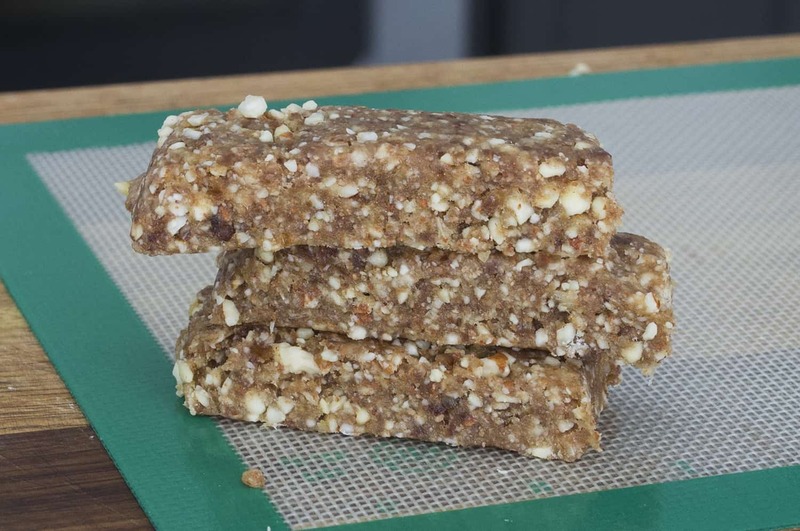 Check out my latest snack that complies with the Paleo diet: Almond Date Bars! Let’s talk about snacks today. Snacks are so important when you have kids. All you parents out there can attest to this, I’m sure. I don’t leave the house without a snack packed, if we are going to be gone more than an hour. Grocery shopping, hardware store, or even just a long drive to a friend’s house, snacks are always on hand. One of our favorite is Almond Date Bars or more commonly, homemade Larabars (or “laraballs” according to an ever-so-precise 2 or 4 year old). 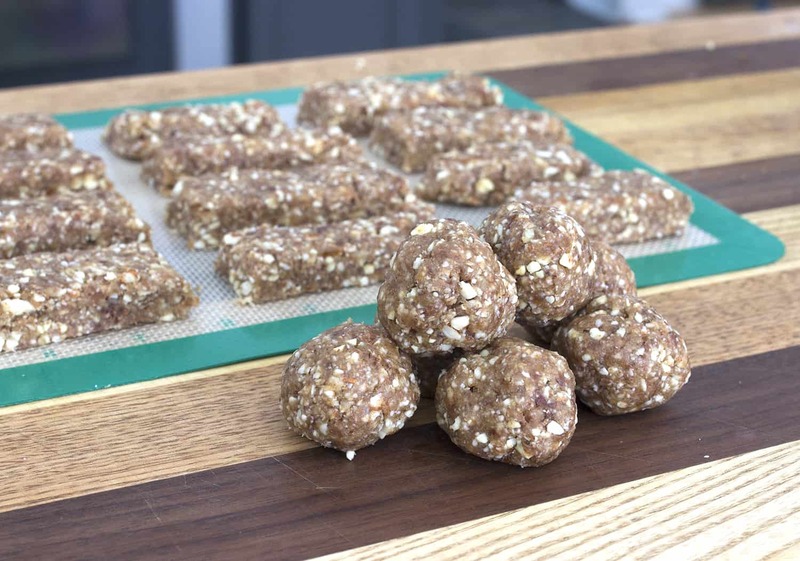 These tasty treats are full of raw nuts and dates. In fact, if you disregard the pinch of salt and splash of vanilla, they are only raw nuts and dates! A snack with a very short list of easily known ingredients? This is a snack I can get behind! When I make Almond Date Bars, I blend them up in my Vitamix. Be careful if you are using a blender! These ingredients put a lot of stress on the motor. I start on low, letting the dates and almonds bounce around and get roughly chopped. When it all looks uniform but still large pieces, I turn up the power 1 or 2 notches until pieces are smaller but still bouncing. Lastly, I turn the power up 1 or 2 more notches and use the damper to push the mixture down to the blade. When a paste starts to form, I quickly stop. It should look blended, sticky, and with chunks the size of the almond pieces in the pictures above. If you smell the motor start to smoke, STOP. You can, in fact, burn out a motor on a Vitamix. Ask me how I know…not with this recipe in particular, but we’ve put our Vitamix through the ringer these last 8 or 9 years. We love it, but we are on our 3rd motor…good thing the warranty is for 10 years! If you don’t have a Vitamix, you can also pulse these in a food processor. I haven’t made them using this appliance, so I can’t explain how it works, but follow the same guidelines, pulse carefully until mixture turns sticky and almonds are chopped small. Be careful not to overwork the motor. There may be some or quite a bit of loose almond bits. Don’t worry about those! Pour the mixture, loose nuts and all onto a clean surface. Kneed the “dough” to incorporate all the loose nuts and make a uniform, sticky ball. 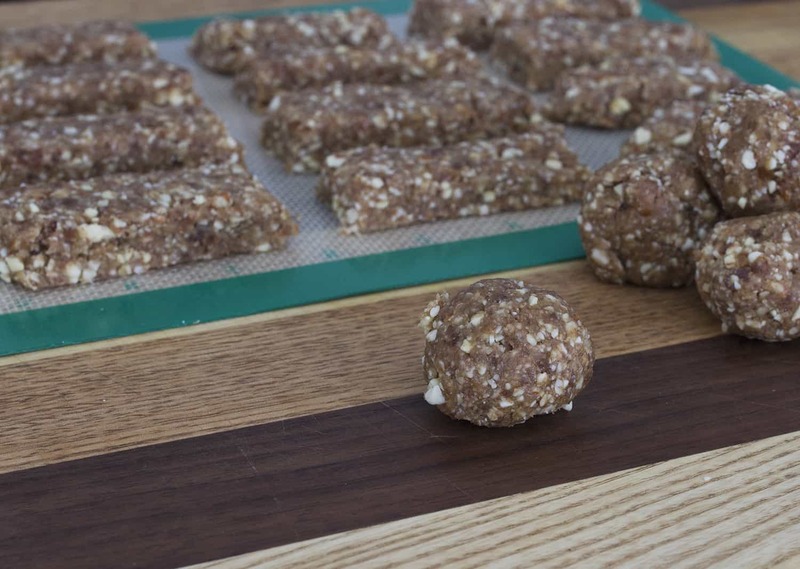 Roll out and cut into bars or grab a small piece and roll into a ball. This step is perfect for little helpers. My kids love rolling these into balls (and snacking on one or two while they are at it!). There are recipes a plenty for Date Bars, aka mock Larabars, but this almond combination is our favorite. Check out this post for more flavor combinations! 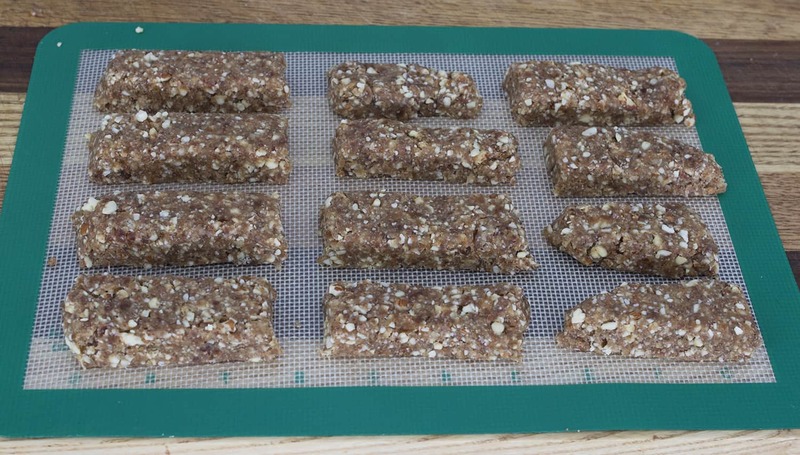 Paleo, gluten-free, dairy-free, kid-friendly homemade Larabars. Simple to blend up. No cooking involved! Put all ingredients into a blender. Turn on low until almonds are roughly chopped. Turn up blender slowly, damping the dates and almonds down. Work quickly, this will be heavy on the motor. Turn off as soon as almonds are chopped small and forms sticky lumps. Pour out onto a mat and kneed together, incorporating any loose almonds. Roll into individual balls or roll out in rectangle and cut into bars.